Erasmus Mundus financial conditions are outlined in the Grant award document. PLEASE be aware: No European or third-country student/staff candidates can benefit from a second scholarship for the same type of mobility under another project under the EMA2-STRAND1. Furthermore, candidates cannot benefit from more than one mobility activity within the same project. contribute, after their visiting scholar activities, to the promotion and dissemination of Erasmus Mundus in general, and the gSmart programme in particular, in their Higher Education Institution and country of origin. 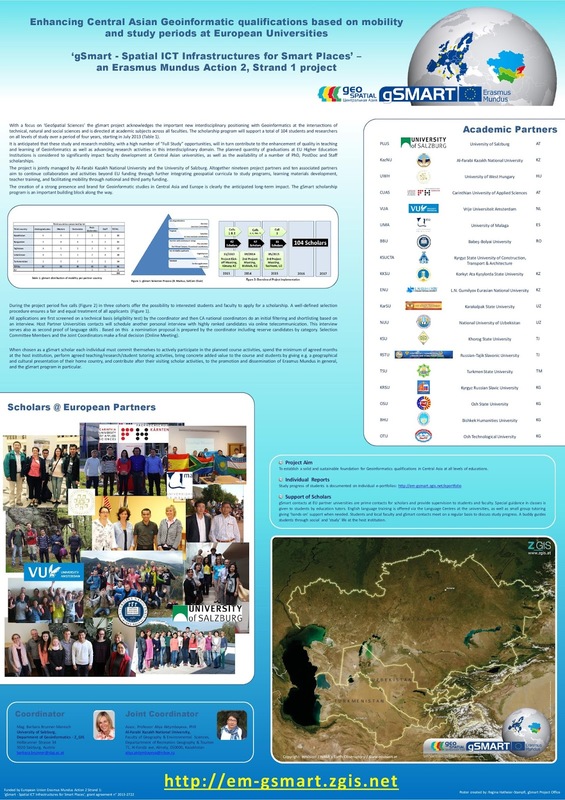 All involved faculty and alumni will be included in the LinkedIn community 'Geoinformatics Education in Central Asia' for continued network integration and involvement.